I remember as a kid visiting the Magic Kingdom and wanting to ride in the race cars that go around the track. It was my first taste of freedom on the open road, except of course for the bar in the middle of my tires preventing me from crashing off the road. I eventually found it funny to purposely jerk the steering wheel to the left or right so the car jolted against the rail and watching my father try to prevent whiplash. 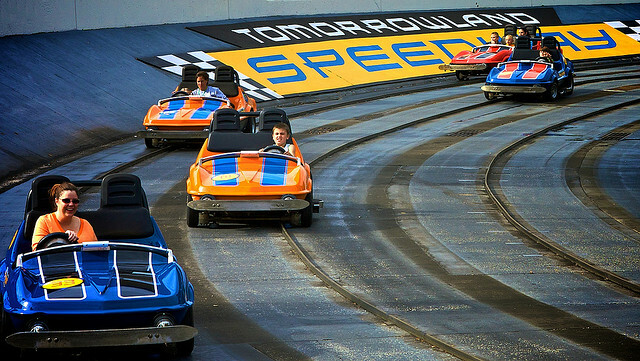 The Tomorrowland Speedway is just plain fun or least I remember it being that way. On our recent trip I decided to take my daughter Hanna on this ride and I think she tried to pull the same stunt I did with my father. After we got out of the ride my neck was stiff and my back needed realigning. Darn the bar in the middle of the road. With a chiropractic visit needed I slowly wandered away from the Speedway as if we were heading towards Space Mountain. 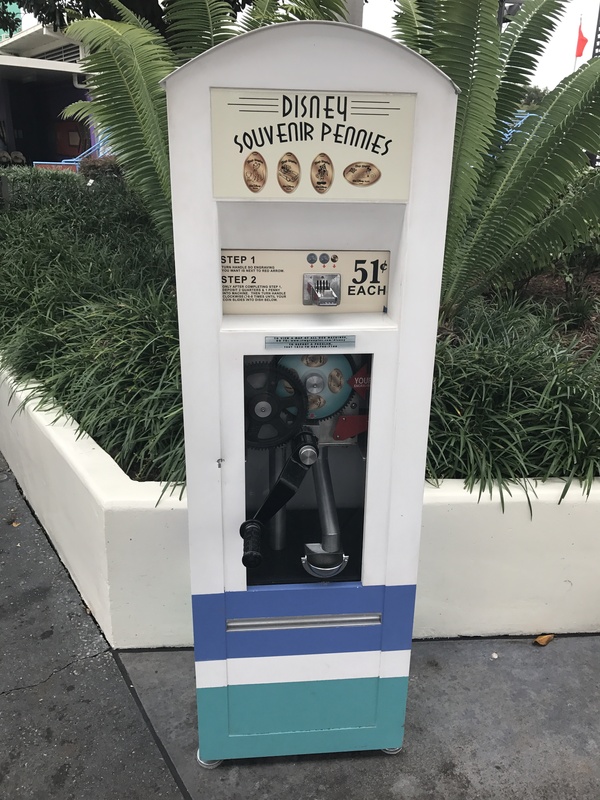 Just past the Speedway there are some souvenir carts around and this is where we found one of the newly placed penny machines. As you can see this is a 4-design hand crank model which at Disney are pretty rare, and after my drive with Hanna using this machine was going to be a bit of work. 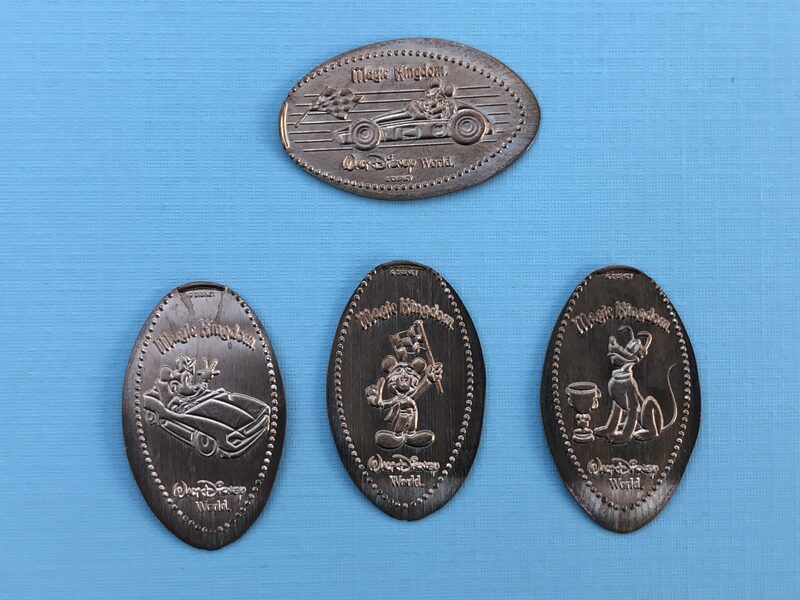 The pressed pennies dropped out and had some nice updated designs on them. This set had Pluto with a Trophy, Minnie in a Speedway Car, Race Car Driver Mickey, and Mickey with a Checkered Flag. With my new pennies stored away we headed further into Tomorrowland to see what we could do next, and I’m sure you can guess there were more pennies to be found.